Now remove the top red and yellow checkers from top of stack, and place the tube over remaining stack. 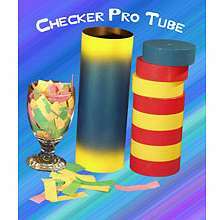 Drop the yellow checker into top of tube, then red checker, and lastly blue checker. You lift the tube and the blue checker is now under red and yellow checkers! One more time cover the stack of checkers with tube. 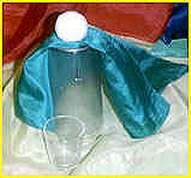 When you lift the tube a glass of liquid appears in place of stack of checkers!